This full-day shore excursion to Rome hits the city’s celebrated historical landmarks like the Roman Colosseum, the Pantheon, Trevi Fountain, and the Spanish Steps. 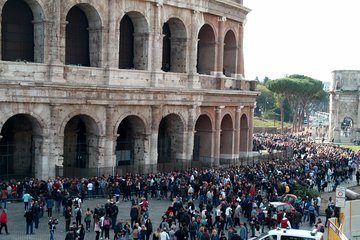 Skip-the-line tickets to the Colosseum and Vatican Museums are included, and additional upgrades to include a licensed guide inside these sites are available at booking. This is a great way to see the highlights of Rome with limited time. This tour was Awesome. Our driver Giovanni was excellent. If you want to see Rome in a day this is the way to do it. We saw everything we wanted to see and Giovanni was so knowledgeable abut everything. We learned so much about Rome and have beautiful pictures and memories. If I could give it a 10 I would. Do not hesitate to book this tour. What a way to see Rome! Our driver had only the 4 of us and made sure we got to see everything there was to see in Rome! Plus hooked us up for a fantastic local lunch! We had such a great day visiting all the locations described in our tour. Our driver was a great guy who was very knowledgeable. He even made lunch reservations at a delightful Italian Restaurant. We ended our tour by meeting our private tour guide at the Vatacian. This is the only way to see the Vatacian and learn so much about it. My family and I had a great time in this tour. I would recommend to get a tour guide specially in the Vatican museums.